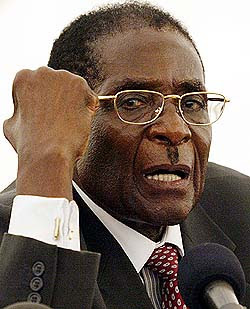 Zimbabwe's President Robert Mugabe has warned his opponents not to protest if they do not win elections on Saturday. "Just dare try it," said the 84-year-old leader at one of his final campaign rallies. "We don't play around while you try to please your British allies." This evil little petty dictator and the desperate measures he is going to by printing 9 million ballots when there are only 5.9million people left in Zimbabwe is offensive when you consider Mugabe is proxying the votes of the dead, including those who he has murdered. One final agony stolen from the grave to legitimize his democratic abortion. So, what will it take to get rid of Mugabe and his cronies? With all the spurious reasons being given for walking into other countries, all around the world, is the fact he is a tyrannical murdering despot, who has totally f**ked over Zimbabwe and it's people, not enough! Oh, sorry, he's a Black man running an African country and there's no oil or other seizable assets to gain control of, so it's alright, he can do what he wants. The hypocrisy of world leaders never fails to amaze me!